This homey cottage, high on the west facing bank between Freeland and Greenbank is situated on one of the most exceptional spots on Whidbey Island. With panoramic 180 degree Sound and Olympic views and a private stairway to 4+ miles of sandy walking beach, the cottage provides an ideal getaway for couples, families and artists seeking solitude and inspiration. 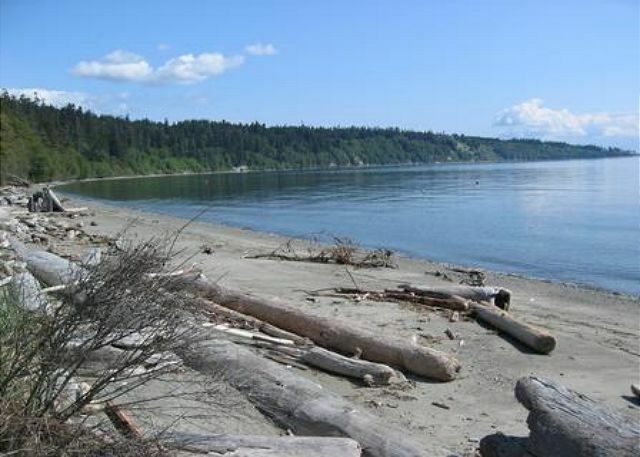 Enjoy dramatic sunsets, campfires by the beach, hikes through the nearby old-growth forest in South Whidbey State Park. If that’s not enough there’s also outstanding salmon fishing from the beach, and a fine private perch to sit and enjoy a good book while keeping an eye on the shipping lanes. The cottage is nestled in a bald eagle reserve and adjacent to protected tidal lagoons, ensuring both privacy and abundant opportunity for wildlife viewing. 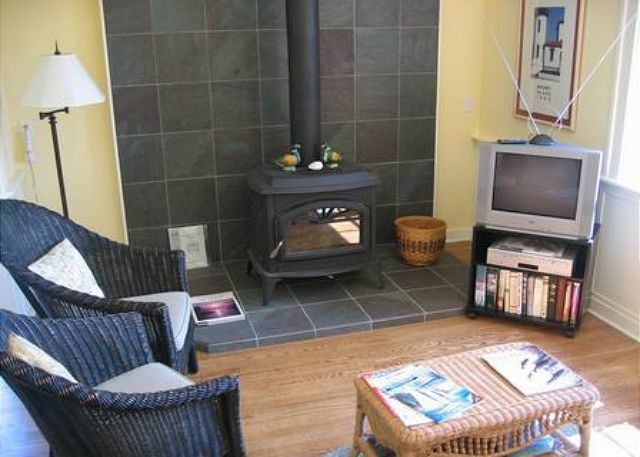 A historic fixture on the Island, the cottage was lovingly and meticulously restored in 2000 and features a real wood burning stove**, oak flooring, modern appliances, TV, DVD, CD player, washer/dryer and a rich assortment of games, books and puzzles. When not enjoying the outside activities and views, guests will appreciate the interior paintings and photographs of Bart Rulon, naturalist and renowned local artist. This little cabin was a perfect getaway for relaxing and enjoying the views and beach. 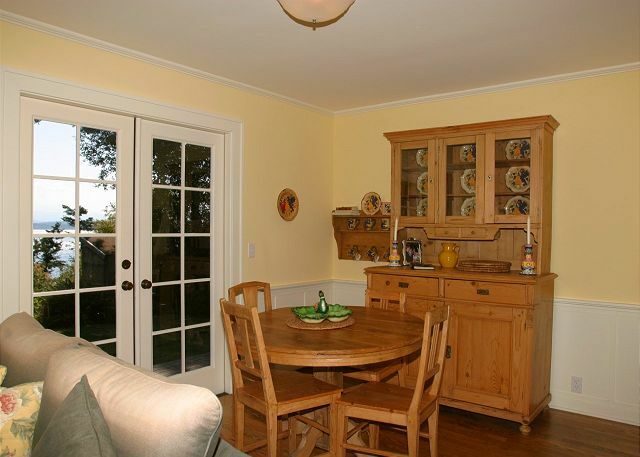 As described, it was clean and it has beautiful trim, windows, and doors and cozy furnishings. The ladder to the second floor is steep and could be dangerous as is the path down to the beach. Both could use some work (railings, stair grips, etc.) The house had plenty of towels, bedding, and dishes (consider some pans without nonstick coating). It was easy to heat on cold days. It would be nice to have written permission to access to the beach chairs and firewood in the shed. Also a note to renters to bring their own wood for the fireplace or allow use of wood on the premises (again put it in writing somewhere. )Overall feel of the place was comfortable and the views are amazing. The beach access is also a high value aspect of this rental. It was easy to contact the rental company with questions. I was disappointed with the amount of extra fees tacked on to the base fee. This would keep me from referring to friends. Easy drive to local shops, restaurants, groceries, and attractions. Thank you for your comments. 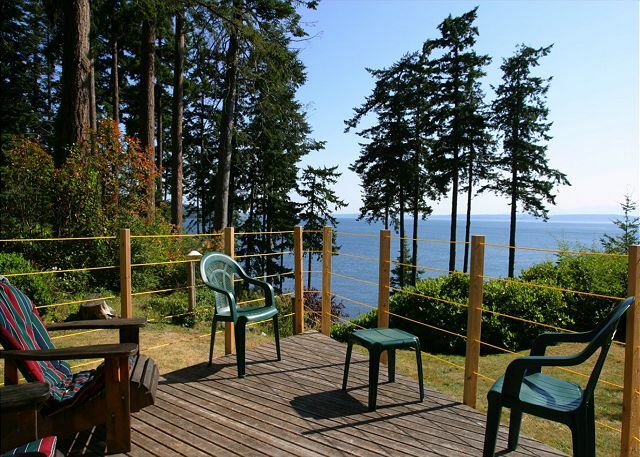 We are so happy this was the "perfect, relaxing getaway you expected on Whidbey Island. Our check in packet sent to guests does inform them that they can use any wood on the property, but if there is no wood, they need to bring their own. Any extra fees on top of rent are listed and disclosed in all quotes prior to booking, and they are competitive with the market. We hope to help you with your next stay on the Island. The cottage is charming and in a wonderful location. Over the years, I've noticed a lack of maintenance of the property. Here are three simple examples - I'm sure there are more I don't see. First, the window screen for the bedroom window fell apart and was never replaced. This costs nothing but allows me to sleep with the window open. Second, clean up the trash. Why is that broken down picnic table sitting in the backyard? Third, the view is a big part of the reason I stay here. Have a landscaper trip the salal hedge, cut back the blackberries and trim the weedy trees that disturb the view. Thank you for your comments we are so happy your stay on Whidbey Island "charming and wonderful. We will take your comments to the owner of the property. We hope we can help you with your next stay on Whidbey. So glad you enjoyed your stay! Thank you for your feed back. We hope we can help with your next stay on the Island. Thank you for your comments. 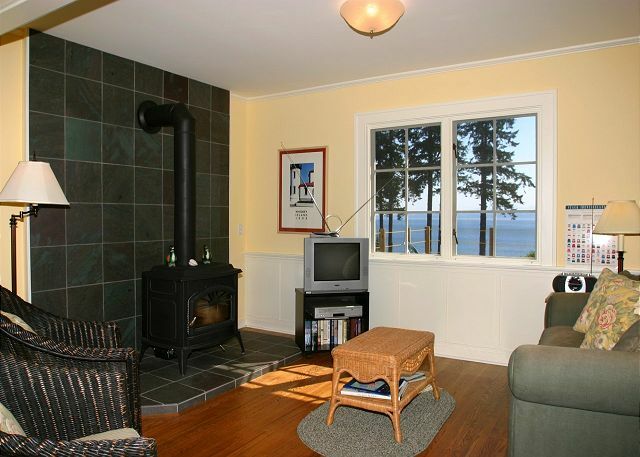 We are so happy you found "exactly" what you wanted for your stay on Whidbey Island. We hope to help with your next stay on the Island! Thank you Tara Management for helping us after hours to get us to our rental. Thank you for your comments. We are happy we could accommodate you with your late arrival, we hope we can help you with your next stay on Whidbey Island. This home is small, but wonderful. I was really after the view, so this was perfect. I sat on the patio, drank coffee, and read while watching the ship traffic go by. Caution: the stairs to the loft are steep, so might not be the best choice for children or the elderly. However, it was just fine for us. Thank you for sharing your beautiful view with us. Thank you for your comments. We are happy you found your stay "wonderful' and the view "perfect". 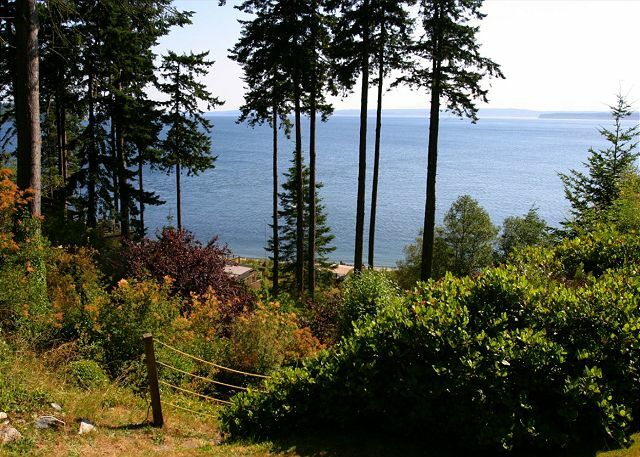 We hope to help with your next vacation on Whidbey Island. We greatly enjoyed our recent stay at this adorable cottage. We had everything we needed. The views are amazing from anywhere on the property and inside the cottage. Would book again in the future. Thank you for your comments. We are happy you "enjoyed" your stay on Whidbey Island. We hope we can help you with your future vacations on the Island. Overall, we enjoyed our stay in the cottage. It is very private and peaceful. Great view of the water and a short walk down to the beach! We enjoyed the wood burning stove too. The house was equipped with everything we needed for the weekend. The only additions I would look into would be a few extra throw blankets for the couch/bed. We got a bit chilly at night. Some Tupperware containers would be nice too. We had a tough time storing our leftover food. Nice to hear you enjoyed your stay on Whidbey Island. Thank you for your review. The cabin is cute and comfortable. The view over the Sound is beautiful and watching the ships pass by very interesting. The reservation process, however, was less than professional. We made reservations for early September. A few weeks later we were told that the cabin was unavailable then and were asked if we would we change our plans. We agreed to move our vacation to later dates. A few weeks later Tara informed us that the property was again not available and asked if we would again change our plans. If we did so. we were promised a $100 restaurant gift card. We did again changes plans, went and had a nice time. We never received the gift card. Thank you for your review. We are glad to hear you loved this home. We are very sorry about the moves and date changes however the guests were very accommodating and worked with us. The owner of this home has a scout group that meets here every September and the dates were changed on them a couple of times. Very rarely do we have to ask guests to move homes. We are sorry about the gift card and it is on it's way. We had a fantastic time at this property. The house is in great condition (it's small, but you'll be outside the whole time), beautiful views, nice grassy property, and a quick walk down a path to the beach. The beach is STUNNING. Almost no other people there, beautiful sunsets, and you can walk quite a bit before you hit private property. Josh at Tara Properties was great. Super responsive, helpful, and even came to make sure we arrived safely and to see if we needed anything (and gave us crabbing tips). Thank you for a lovely weekend! Thank you so much for your review! We're glad you enjoyed the home and the surroundings. We're also so glad that Josh was so helpful to you during your stay. Thanks again for your comments! 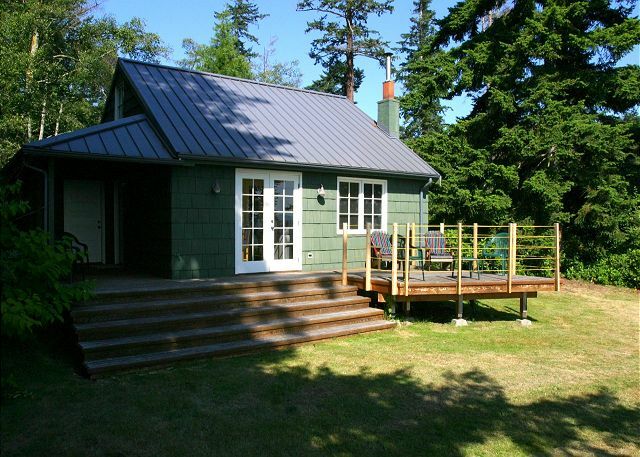 This is a small, bright and cheery, well maintained cottage above a classic Northwest beach on the Puget Sound. There are minor things I could quibble with, but overall a very pleasant and relaxing place to stay. Glad to hear you enjoyed your stay and were able to relax and have a good time. A note to future renters, if any issues arise during your stay feel free to call our office and we'll be happy to resolve them. This little cabin had everything we needed! Grassy areas fir frisbee, beach access for beach combing and picnics and a terrific view. The deck is great for taking in the ships going by and beautiful peaks beyond. Lots of bird song and frogs and wave sounds at night. 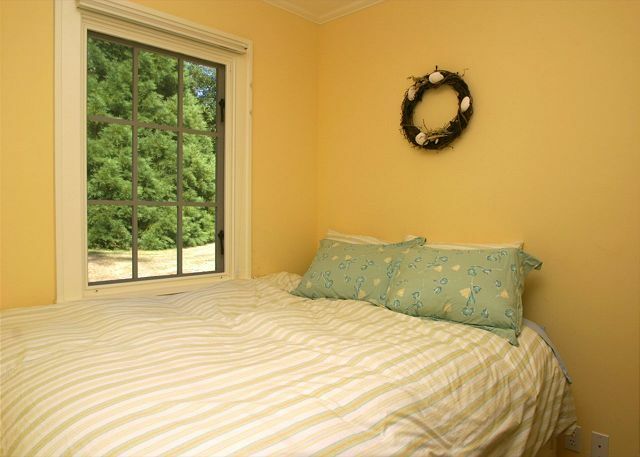 The main bedroom is sunny and a very comfortable room to sleep in. My 10 year old boys loved the loft to play and sleep. Yes the couch has no support but who sits on the couch when you have all the beautiful outdoor space! Thanks for your review! We are so glad you had such an enjoyable experience! WE are very happy these folks enjoyed the home. There is a washer and dryer in a separate little out building as indicated in the check in packet and property description. Sorry these guests missed that. I have hilighted it in the check in packet for better visibility. we only used the cottage for extra beds to supplement the adjacent homes we rented for our large meeting. Bed it was perfect for that. I booked at the last minute and everything went very smoothly. The cottage is very sweet and cozy. My son and I stayed here for a couple of days and it was just perfect. It is tucked away and feels private even though there are other houses around. The views are beautiful and the beach feels wild and peaceful. I went out on the back patio one morning and there was a deer just hanging around. It is a great little place. The only improvement I can think of is getting a nicer shower head for the shower, as the one in there has those thin streams that sort of sting. I highly recommend it! Very romantic. 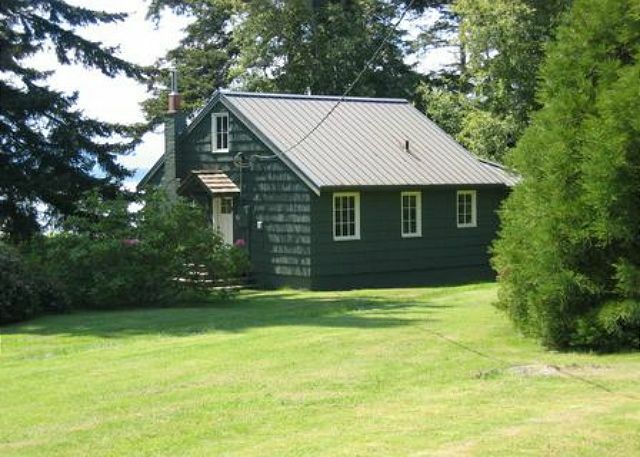 This cottage on a bluff high above Puget Sound was a hit with three senior women -- plenty of charm; well-equipped kitchen; deck with view of water, eagles, deer, passing ships, and distant Jefferson County; very quiet neighborhood; conveniently located to Greenbank, Langlely, Freeland. Coupeville and Port Townsend ferry; also wi-fi and CD player we used and gas fireplace and TV we didn't. The photos and description were accurate. 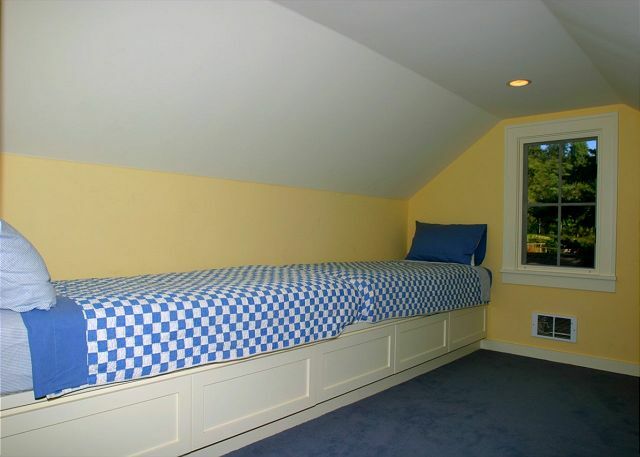 Two FYI caveats: the stairs to the sleeping loft are very steep and narrow. and the road and path to the beach are also very steep. This is our third visit to this property and we are never disappointed. Location, location, location. The best part about this property is that it is steps away from the beach. 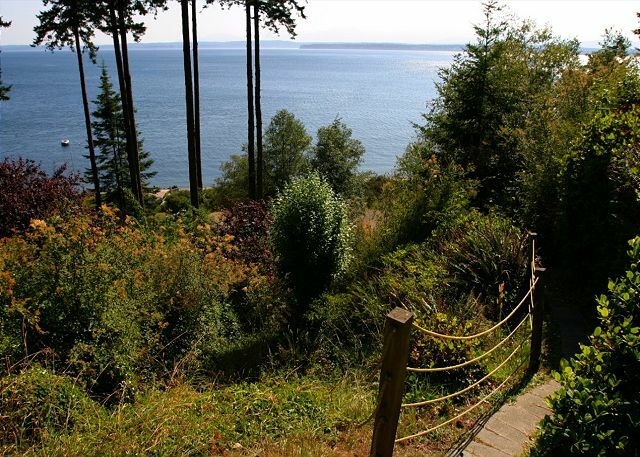 There is a winding path down to the beach from the backyard of the property, and that beach adjoins South Whidbey State Park. The view from the cottage is breathtaking. It is small and cozy and very clean. I wouldn't recommend it for more than two people--it is pretty small. The rental company is very responsive, via email and phone. We had a small problem when we arrived on Christmas day with the code on the door not working (probably due to a power outage), but we called the emergency number and reached a very friendly, helpful person (Melanie!) who reset the code and wished us a Merry Christmas. I would only make two suggestions for improvements to the cottage: both the sofa and the mattress should be replaced. Other than that, we had a great time and would stay here again! It was wonderfull. I spent very little time researching this trip. I went on the price and the Pictures. I didn't even read the whole description. Mostly relied on the photos to be accurate. This cabin exceeded my expectations. The house itself is charming, and has an incredible view! I have never seen a more beautiful hardwood oak floor, and everything was clean. The bed was firmer than I like. The couch was softer than I like. The deck chairs need a good scrubbing. I think if you really wanted that view, the property is worth what I paid. This is a wonderful one bdrm cabin with a loft with 3 twin beds. The beach access is amazing. Lots of stairs but worth the climb back up. 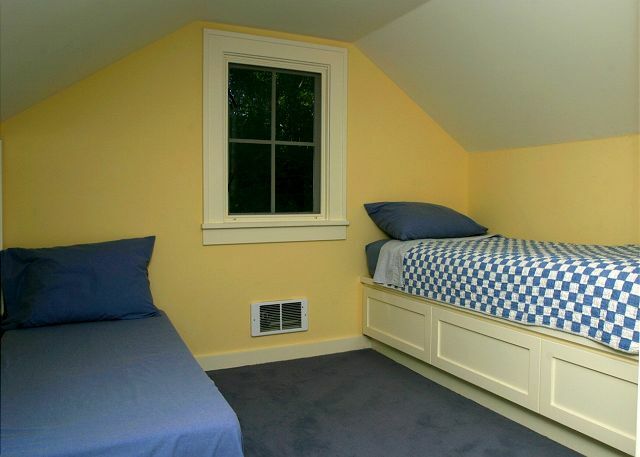 The loft with twin beds is up a almost ladder-like staircase (be careful if you have small children). The cabin is well-stocked to make meals at home. The laundry is in a separate building but worked fine. We loved the cottage! It is quaint, provided everything we needed and was so relaxing. We would definitely stay here again! Pictures of the cabin do it justice. It's a great spot in the summer as there's plenty of space to be outside and on the long beach. The house is showing signs of wear and tear. A bit of paint, getting the electric stove to work (all burners), and having a safer "enclosure" plan for the deck (it's just yellow rope), and replacing the couch that you literally sink into would do the house a world of good. But, in the end, the size and space worked great for our family. I would not stay here if our kids were younger (less then 4yo) as the stairs to the loft are quite steep. We stayed here over a long weekend. The location is nice and what we were looking for--secluded and quiet. The deck provides great views and there were many birds to watch from the windows. It's a quick walk down to a very quiet beach directly from the backyard. It is a 10 minute drive to a large grocery store and banks. Its a 20 minute drive to downtown Langley which is a nice place to walk around and get food. The house was nice enough. There was adequate room for our small family of 4. The loft is unique in that it feels separate from the main living area so our kids were able to nap and sleep there without a problem of noise. The main floor bedroom is very small but the bed was comfortable. The living room has nice windows looking out on the water but you lose this as soon as you sit on the couch which is too soft. We made use of the wood stove which was cozy and really warmed up the house. The kitchen was not great. The pans are all in poor condition and some items felt unclean (french press, tea kettle). There were basics missing to make a longer stay comfortable (e.g. measuring spoons, plastic wrap/tin foil, reusable storage containers-the things that are nice to have when you plan to cook in the house). I tried to make a pie but there were many things missing so it required a lot of improvisation. There was some confusion on the agency's part about our request for early check in but it got cleared up for our arrival. It became a problem again when we got locked out of the house due to a non-functioning access code. Fortunately we got a quick response from the rental company who reset the locks. Overall a nice play to stay but we may look to another location next time we make the trip. Generally, we were happy with the accommodations, although the rental was very small. We couldn't even fit our suitcase in the bedroom. There were some ants in the kitchen when we arrived, and continuously throughout our stay, although their numbers stayed small. The beach was lovely, and we enjoyed the wood stove. Mostly, though, I was miffed by the three additional mandatory fees, which increased each night's stay by nearly 50%--and then the requirement to do a fair amount of cleaning before we left (one of the fees was an $80 cleaning fee). We looked for a place to get away for the weekend for the kids and for the Seahawks game. The location was great, close to the ferry and right above the beach. The kids had the whole beach, which was sandy and full of driftwood, to themselves. Plenty of yard also to mess around in and play catch. The house is small and cozy, but we fit fine with our 4 kids. Everything but the food in the kitchen. A few cautions about the house. The heaters are very hot, so don't put anything near them or things will melt. Also, the stairs leading up to the upstairs are very steep with no grips on them. We were constantly worried about the kids going up and down them and did have our 7 year old fall down them with an expensive Kindle (bye bye Kindle). We would also suggest the owners level out the kitchen table - its angle makes playing board games difficult. Other than that, the house is great. Thanks so much! 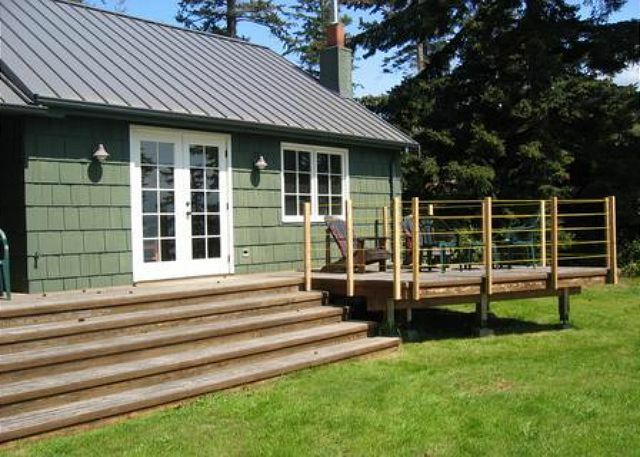 This cozy cabin is in an excellent location: just steps away from the beach (with access to South Whidbey State Park) and a short drive to Freeland and Langley. Beautiful views of the water from the living and dining areas. Everything in good condition. Wood burning stove to keep things toasty at night. I have stayed before and I love the location. I think however that some attention should be paid to the stairs, they were in rough condition in 2011, and are worse now. Fabulous little cottage, great character, wonderful view. Perfect for single, a couple, or a small family. Really enjoyed it. The cabin needs a new stove-the only large burner works erratically. The locking system did not always work. The blackberries need trimming (or even better eliminating). Most importantly, however, we love the cabin and enjoyed ourselves immensely. This is the second time we have stayed there. We loved the whole experience. The house was sweetly decorated, clean, and had everything we needed for a great getaway. The staff was helpful and easy to get hold of. Everything was just as advertised. I want to go back!! Love the place. I would get rid of the Japanese Knotweed in the side/backyard. It is a nasty invasive species. We enjoyed our stay at Smugglers Lagoon Beach Cottage very much and would definitely go again. Our only feedback would be the masterbed was uncomfortable. Everything else was as described. It was a lovely place to stay as a family. 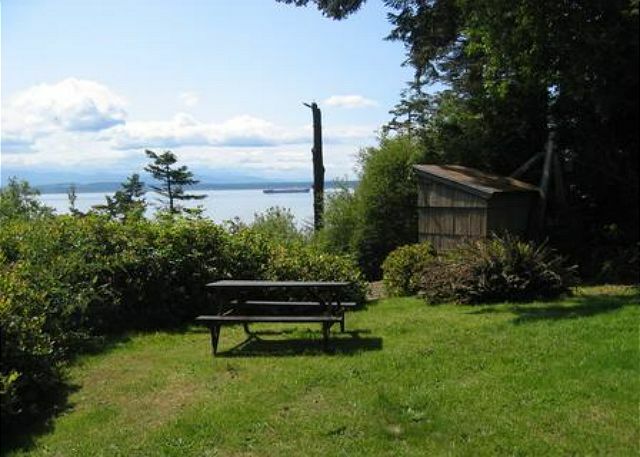 Very nice and quiet cabin with a fantastic view of Puget Sound and the passing cruise ships. It was fully stocked with all the kitchen and bath essentials needed for our weeks stay. We seen three deer laying in the front of the cabin when we drove in and five otters passed through the back of the cabin that same night, not to mention the rabbits, chipmunks and eagles in the area. Only one good TV channel though, otherwise very relaxing. Pros and Cons Smugglers Beach cottage. 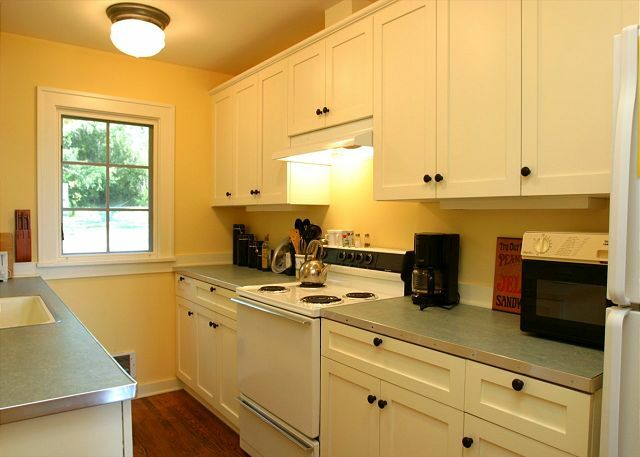 Pros:The beach cottage was lovely, with hardwood floors throughout. The wood stove made it very cozy. We did bring our own firewood and left extra behind for the next guests. It was just me and my husband, so we didn't explore the upstairs loft. The view was incredible! We loved watching the ships go by, and the beach was nice to walk and talk on. Cons:There was no wireless internet reception and there was not really any cable tv as promised. The channels were through a converter box and 5 of them were evangelical, the other 2 were a weather cable weather station and re-runs of "Two-and-a-half men" and "The big band theory", back to back to back to back to back to back, you get the idea. The kitchen needs more sturdy silverware to eat with and appliances were sparse. The small, small blender did not even work. the cottage was just what the doctor ordered for our family - a chance to step back and rest in a great setting. very private, quiet and relaxing. The beach was great!! Floors were quite dirty, and the bbq needs replacement, but otherwise a beautiful property in a stunning location. I'd definitely recommend to others! Great location with territorial view and easy walk down to the beach. Very comfortable for three guys out to do some fishing. Perfect little get away cottage. Private, easy access to a beautiful beach. Plenty of wild life. Beautiful ocean view from cottage and beach. Romantic enough for me to propose to my finace right on the beach. Looking forward to coming back here. Our time was beautiful, and the property and beach access could not have been better! This was quite a place! We quite enjoyed the scenery and the solitude!!! And the house was perfect for the two of us! Loved this place and the property management company! Would go again in a heartbeat. Our stay was wonderful. The only negative was a mishap with the cleaning people, so the place hadn't been cleaned when we arrived. The property management company was horrified by this -- clearly, it was just one of those things that occasionally happen and not a standard practice. They made it right and we heartily recommend them and the property. It's a sweet, comfortable place -- great location right above the beach and near a beautiful state park. The cottage was cozy and comfortable. The perfect place for 2 people. The view was spectacular. We were lucky and had fabulous weather the entire week. We thought that the deck and deck chairs needed to be powerwashed. A small outside table would be nice as well as wine glasses in the kitchen. Otherwise it met our expectations. We would consider renting again. The house has a long series of stairs to get down to the beach, great view, but some of the stairs were in need of maintenance. The loft with the kids' beds has a VERY steep staircase, it worried us at first for the kid's safety, but they LOVED it and it worked just fine. The cabin was very secluded but close to all things fun on the Island. This was the ideal place to relax and enjoy the quiet. I never once heard my daughter say she was bored.